Since 2000, the successive variants of Clio RenaultSport have resulted in it becoming the most popular hot hatch of its class, with over 70,000 worldwide sales. The RenaultSport version of the brand's best-selling model has been unanimously praised by enthusiastic owners as one of the market's best hot hatches, and also one of the most fun to drive. The challenge faced by the engineers from RenaultSport Technologies was to build on the existing qualities of Clio RenaultSport 197 and take its inherent strengths and dynamism to a new level. front wing air-extractors and a rear diffuser, two technologies which form a package that is unique in the hot hatch market. As with the Clio RenaultSport 197, the front and rear quarter panels of the 200 are widened to accommodate the 1,520 mm front and rear track. Front styling incorporates a new, generously-sized, low-positioned air intake, designed to feed cooling air to the normally-aspirated 147.5 kw 2.0 litre 16V engine. The sills, extractors and wide front and rear quarter panels all highlight the performance credentials of Clio RenaultSport 200 Cup which features RenaultSport's new styling cues in the form of a two-tone colour scheme based on a choice of Gloss Black or Anthracite finish for the front bumper centre section and blade, door mirror housings and rear diffuser. The diffuser now incorporates more visible twin exhaust tailpipes. A new design of alloy wheel completes the revised appearance. Clio RenaultSport 200 Cup sees the introduction of a brand new, exclusive Alien Green pearlescent paint finish. The pearlescent Liquid Yellow returns to Clio RenaultSport 200 Cup after only being available previously on the limited-edition Clio RenaultSport 197 F1 Team R27. Mercury also becomes available for the first time joining Toro Red, Racing Blue and Black. Clio RenaultSport 200 Cup's aerodynamics include a new frontal blade, front-wing air-extractors and a rear air diffuser, a development which is unique for this segment. Thanks to these features which take their inspiration from Formula 1, Clio RenaultSport 200 Cup's aerodynamic drag has been cut by 0.02 compared with that of its predecessor to 0.753. The extractors visible on the front guards contribute to the car's aerodynamic performance by neutralising the turbulence produced by the wider guards and play a part in improving the model's CdA. They also facilitate the extraction of hot air from underneath the bonnet, while the vents are angled to channel airflow along the sides of the car for enhanced performance. Clio RenaultSport 200 Cup is also equipped with an air diffuser, an aerodynamic feature normally only found on high-end sporting cars. Air passing underneath the vehicle is channelled via the flat bottom to the diffuser where it accelerates before being expelled at a higher speed. Combined with the shape of the diffuser, this provides a zone of low pressure under the car, sucking the chassis to the ground. Compared with a conventional wing, diffusers generate significant downforce without resisting forward movement. On a motorway, at 100 km/h, lift is reduced by almost 35 kg. The diffuser is designed to function in association with the rear flat bottom which leaves space for the exhaust silencer and lateral-mounted tailpipes. The interior performance credentials are mirrored in details such as the aluminium pedal facings, as well as by the perforated leather-covered steering wheel with visible stitching and yellow centre-point marker. 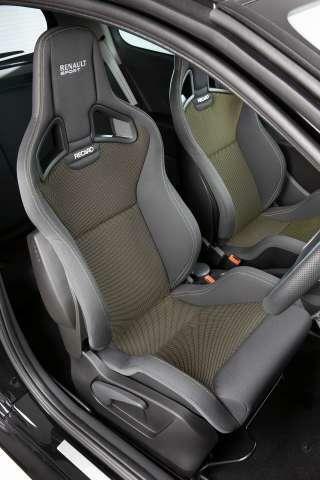 The unique RenaultSport seats are exceptionally comfortable and ensure a high level of body-hugging lateral support. The new yellow rev-counter includes an audible and visible gearshift indicator to help optimise gear changes. The size of the figures displayed on the rev-counter increases as the needle approaches the red zone. RenaultSport badging is visible inside the cabin on the rev-counter background, sills and front seats. Seats designed and developed in association with Recaro are fitted as standard to the Cup Trophée. They are equipped with lateral airbags, plus a rigid, glass-fibre/polyamide-injected shell which provides the sort of all-enveloping experience associated with motor sport. The slots for the harness belts and integral head restraint add a further sporty touch, while at the same time holding occupants firmly in place. As with the previous Clio RenaultSport 197, the new Renault Clio RenaultSport 200 Cup benefits from wide front and rear tracks of 1,520 mm and a wheelbase of 2,585 mm for greater stability. The front suspension's independent steering axis layout is unique to the segment. This technology virtually eliminates torque steer under acceleration. Unlike a MacPherson-type arrangement, the steering axis of the front suspension is totally independent of damping. To minimise weight, Clio Renault Sport 200 Cup's independent steering axis front suspension employs aluminium components and guarantees precise handling and outstanding traction whatever the conditions. The rear suspension features a programmed deflection torsion beam which has been uprated to complement the efficiency of the front's independent steering axis layout for precise, immediate turn-in. Meanwhile, body movement is kept in check thanks to the larger diameter front anti-roll bar, up from 20 mm to 21 mm. Specifically-developed Continental Sport Contact 3 tyres (215/45 R17) ensure swifter, more precise steering response. The new design of the standard aluminium alloy wheels is now 1 kg lighter and the ensuing gain in terms of unsprung weight contributes further to the new car's enhanced steering response and crisp acceleration. New Renault Clio RenaultSport 200 Cup has been engineered to deliver an exacting ride and uncompromising driving enjoyment. Its ability to corner flat is enhanced by stiffer springs (uprated 27 per cent at the front and 30 per cent at the rear) for even better handling, and stiffer (by 15 per cent) shock absorbers. Torsional rigidity has been improved by 10 per cent enabling the potential of the independent steering axis front suspension to be fully exploited. Last but not least, the Cup chassis now comes with a higher ratio steering rack (7.5 per cent quicker) which, combined with other specific development work, favours feedback to the driver in conditions of varying grip. 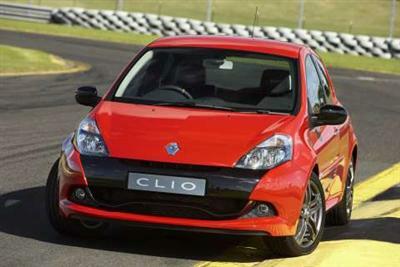 The Clio RenaultSport 200 Cup weighs 1,204 kg, boasting the best power-to-weight ratio in its class at 73.5 kw per tonne. Clio RenaultSport 200 Cup's powerful, durable brakes combine with the latest Continental Sport 3 tyres (215/45) to guarantee stopping distances identical to those of very high-end sporting models. Pedal travel is progressive and easy to gauge. The 312 mm diameter ventilated front discs are paired with four-pot Brembo callipers, while the 300 mm diameter solid rear discs function with single-piston TRW callipers. 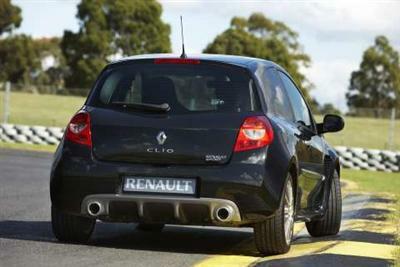 Renault Clio RenaultSport 200 Cup is powered by the latest-specification normally-aspirated 2.0 16V engine (F4R RS). With a specific power output of more than 70 kw/litre, this powerplant delivers an extremely high level of performance for the hot hatch segment. In addition to the gains achieved at low revs, peak power has been increased by 2.5 kw to 147.5 kw at 7,100 rpm. Meanwhile, the low-end (below 3,000 rpm) torque boasted by Clio RenaultSport 200 Cup has been boosted by an impressive 20 per cent over that of the 197 thanks to a new cylinder head and fine-tuning of the engine mapping. In fact, more than 95 per cent of maximum torque is still developed at 3,000 rpm. The first, second and third gear ratios have all been shortened for punchier acceleration and to facilitate motoring in built-up areas. This engine drives through a manual six-speed gearbox (TL4) and claims maximum torque of 215 Nm at 5,400 rpm (compared with 5,500 rpm for Clio RenaultSport 197). Clio RenaultSport Cup accelerates from standstill to 100 km/h in just 6.9 seconds and on to a top speed, where permissible, of 225 km/h. Despite the power increase, an illustration of the development work that has gone into this powertrain has resulted in its fuel consumption being slightly reduced to 8.2 l/100 km from 8.4 l/100 km in the combined cycle and CO2 emissions similarly down to 195 gm/km from 199 gm/km. Clio Renault Sport 200 Cup - for enthusiastic customers who are looking for a well equipped performance car and are passionate about their driving. Clio Renault Sport 200 Cup Trophée - for customers with the same amount of passion for their driving, but who are also looking for a higher level of standard equipment. Despite its compromise-free, performance intent, the Renault Clio RenaultSport 200 Cup is equipped with a particularly generous equipment specification to simplify and enhance life on-board. On both versions, customers can also choose from options such as the new TomTom®, the first integrated GPS navigation system, and metallic paint. 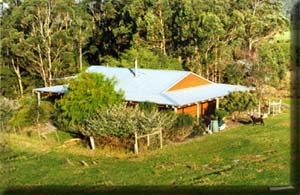 NOTE: * Prices exclude dealer delivery fees and the various state/territory statutory charges.